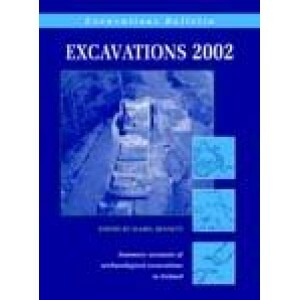 Excavations 2002 is the biggest ever issue of the annual bulletin, containing just short of 2000 excavation reports. As levels of both public and private sector development continue to increase, the opportunity arises to excavate more and more sites of potential archaeological significance. As well as bypasses and drainage schemes, activity in 2002 focused particularly on Bord Gáis Éireann’s Pipeline to the West, the current stages affecting mainly counties Clare and Limerick. The controversial South-Eastern Motorway through the archaeological complex at Carrickmines in south County Dublin also necessitated a number of excavations. In terms of the breakdown of excavations by county, the Pipeline to the West has pushed both Clare and Limerick into the top four this year, which are Dublin (252 excavations), Limerick (202), Cork (169) and Clare (143), and the counties with the lowest number of excavations are Fermanagh (3) and Laois (5). Illustrated with photographs and plans, Excavations 2002 not only is an invaluable tool for any archaeologist but also contains information of use to anyone interested in the heritage of their local area; it offers excellent value for money. Publication Data Forthcoming, 30 August 2004, lxii+545pp, hardback, illustrated.